Part 1: Memory. In his rookie season, Revis watched film with safety Kerry Rhodes. He did not understand the difference between watching and studying. Now in his third year, Revis studies film daily, during meetings and from 60 to 90 minutes on his own. This season, Revis stopped viewing run plays, because he reacts to those instinctively. Instead, he watches every play from the current season, dozens of times, of the next receiver he will face. First, he looks for body language. Does the receiver tilt his shoulders forward on a pass play? Has he run go routes with his left foot forward at the line? Does he pop and flex his fingers before running across the middle? Revis does not play poker, but he said every player has tells, including him. The key is finding what separates a Moss from a Colston, then exploiting that. Part 2: Muscle. Revis does additional off-season training at Fischer Sports. He lifts monster truck tires, pulls sleds and runs up mountains in the brutal Arizona heat. Each week, they hold Festivus Fridays, where fellow professionals like Philadelphia Eagles quarterback Donovan McNabb and Revis run through 8 to 10 drills without a break, stop for “halftime,” then perform every drill again. This year, Revis and his trainer, Will Sullivan, studied each receiver he would face this season and trained accordingly. Revis drew additional motivation from Adrian Wilson, the Arizona safety who followed a Super Bowl appearance by training the same way. The result: Revis said that he rarely tired during games. Part 3: Mind-set. When Dennis Thurman joined the Jets’ coaching staff last off-season, Revis, already a Pro Bowler, started an early conversation with two words — coach me. Thurman found Revis more advanced than cornerbacks with similar experience, ahead in technique, fundamentals, and knowledge, but still, Revis wanted most to learn. In Revis, Thurman found the most competitive of cornerbacks, the kind of guy who wishes he could cover the Hall of Famer Jerry Rice. In the off-season, Revis studies the greats at his position, even shoots text messages to Sanders for advice. 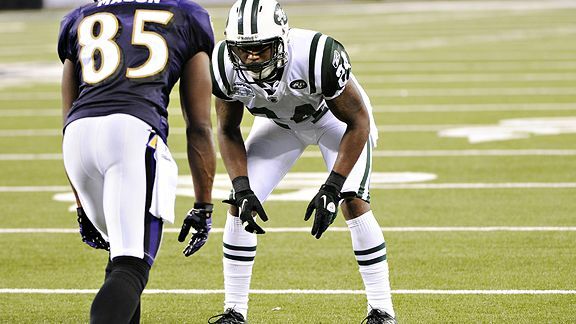 Revis plays with a quiet swagger and an unshakable confidence. That came from his uncle Sean Gilbert, a longtime N.F.L. defensive end. Gilbert remains Revis’s harshest critic, but even he does not seem surprised by his nephew’s progress.